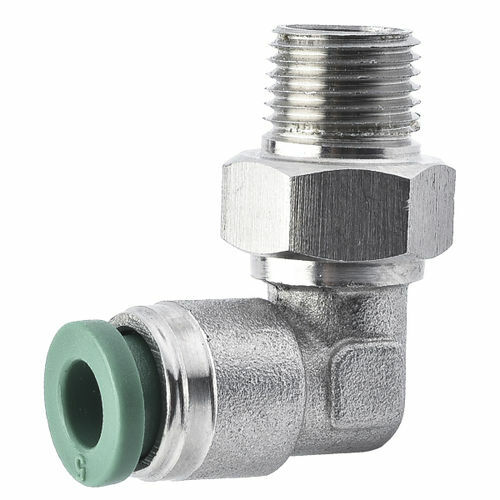 Stainless steel push to connect fitting with plastic release button male elbow for connecting a tube to a female threaded connection, Joins a male thread to nylon, polyurethane, or polyethylene tubing at a 90-degree angle, the thread has a sealant applied to ensure an air- and water-tight seal. The Stainless steel push to connect fitting with plastic release button is suitable for handling pressures up to 435 pounds per square inch (psi) (30 bar) and has an operating temperature range of -20 to +120 degrees C (-4 to +248 degrees F). This fitting meets Restriction of Hazardous Substances (RoHS), Food and Drug Administration (FDA), and EU regulation 1935/2004/EC technical specifications. This stainless steel tube fitting is is suitable for use with air, water, and steam in both vacuum and pressure applications, such as food processing in a wash down environment.